Sridevi’s sad demise due to massive heart attack in Dubai! Hindi Film Industry’s icon and chirpy actress Sridevi’s sad demise shocked Nation as well as Movie world. India’s gifted actress passed away after a massive cardiac arrest in Dubai. She was 55. Sridevi, husband Boney Kapoor and her younger daughter Khushi were in Dubai to attend Mohit Marwah’s marriage. Presently, sympathizers and fans are rushing to Sridevi’s house in Mumbai to be by her elder daughter Janhvi’s side who couldn’t be in Dubai due to her shooting of a film. Sridevi Kapoor also know s Shree Amma Yanger Ayyapan was born on 13 August 1963 in Sivakasi, Tamil Nadu, India. Now her sad demise happened on 24 February 2018 in Dubai, United Arab Emirates due to cardiac arrest. She was an Indian film actress and producer who has starred in Tamil, Telugu, Hindi, Malayalam, and Kannada films. She was famous as the first female “superstar” of India. She has pan-Indian appeal and presence. Sridevi began her career as a child artist in M.A. 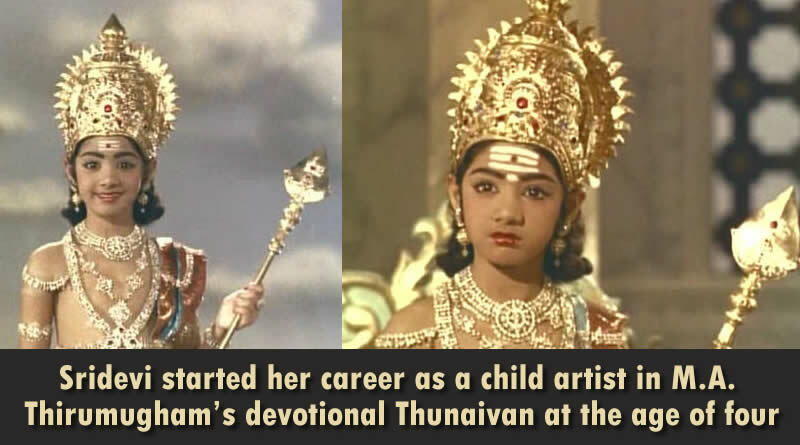 Thirumugham’s devotional Thunaivan at the age of four and continued to act as a child artist in Tamil, Telugu, Malayalam and Kannada movies. 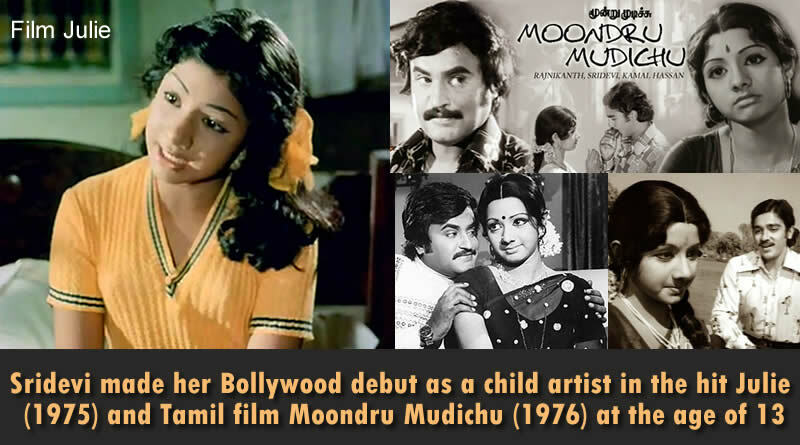 She made her Bollywood debut as a child artist in the hit Julie (1975) and essayed her first adult role at age 13 with the Tamil movie Moondru Mudichu (1976). 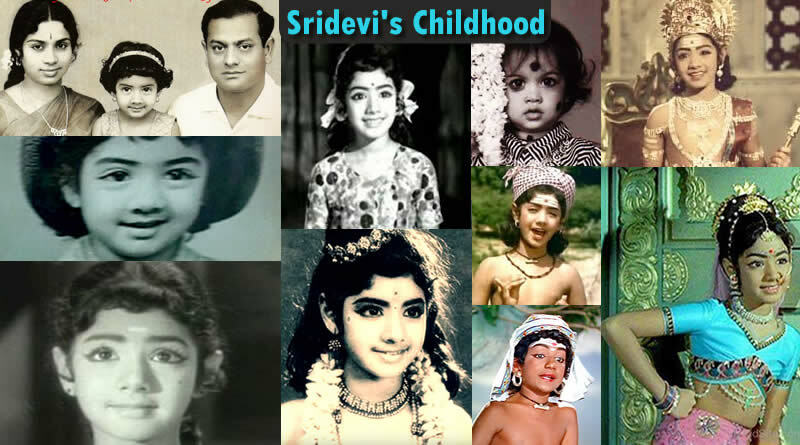 Sridevi’s childhood memories and photos! Sridevi started her career as a child artist in M.A. Thirumugham’s devotional Thunaivan at the age of four! Sridevi made her Bollywood and Tamil debut as a child artist in the hit Julie (1975) and Tamil film Moondru Mudichu (1976) at the age of 13! Sridevi acted in South films like 16 Vayathinile (1977), Sigappu Rojakkal (1978), Varumayin Niram Sivappu (1980), Meendum Kokila (1981), Premabhishekam (1981), Moondram Pirai (1982), Aakhari Poratam (1988), Jagadeka Veerudu Atiloka Sundri (1990) and Kshana Kshanam (1991). Sridevi acted in Bollywood films like Solva Sawan (1978), Himmatwala (1983), Mawaali (1983), Tohfa (1984), Naya Kadam (1984), Maqsad (1984), Masterji (1985), Nazrana (1987), Mr. India (1987), Waqt Ki Awaz (1988) and Chandni (1989). 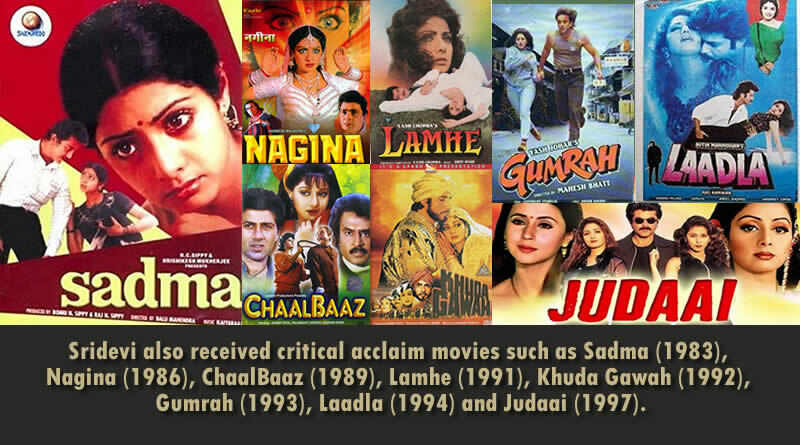 Sridevi also received critical acclaim movies such as Sadma (1983), Nagina (1986), ChaalBaaz (1989), Lamhe (1991), Khuda Gawah (1992), Gumrah (1993), Laadla (1994) and Judaai (1997). Sridevi returned to films after a 15-year-long hiatus with English Vinglish (2012), Puli (2015), Mom (2017) and Zero (2018). 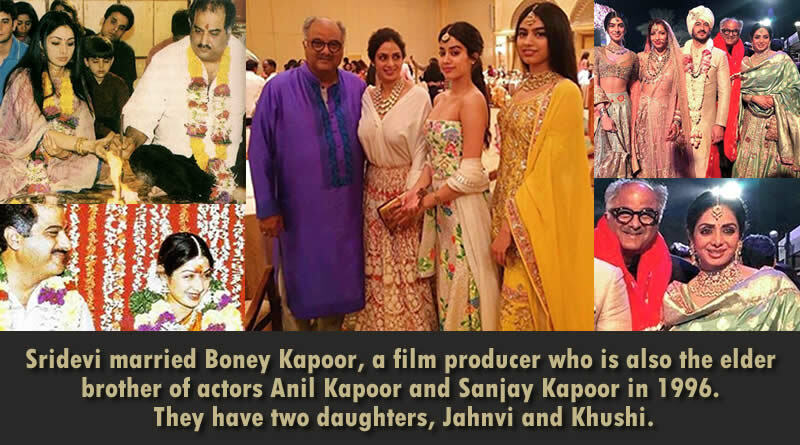 Sridevi married Boney Kapoor, a film producer who is also the elder brother of actors Anil Kapoor and Sanjay Kapoor in 1996. They have two daughters, Jahnvi and Khushi. 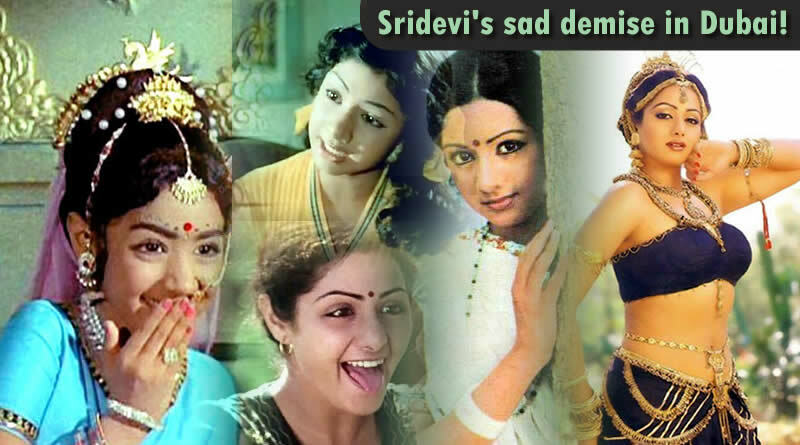 The legendary Sridevi proven herself as one of the leading actresses of Tamil and Telugu cinema, with roles such as 16 Vayathinile (1977), Sigappu Rojakkal (1978), Varumayin Niram Sivappu (1980), Meendum Kokila (1981), Premabhishekam (1981), Moondram Pirai (1982), Aakhari Poratam (1988), Jagadeka Veerudu Atiloka Sundari (1990) and Kshana Kshanam (1991). 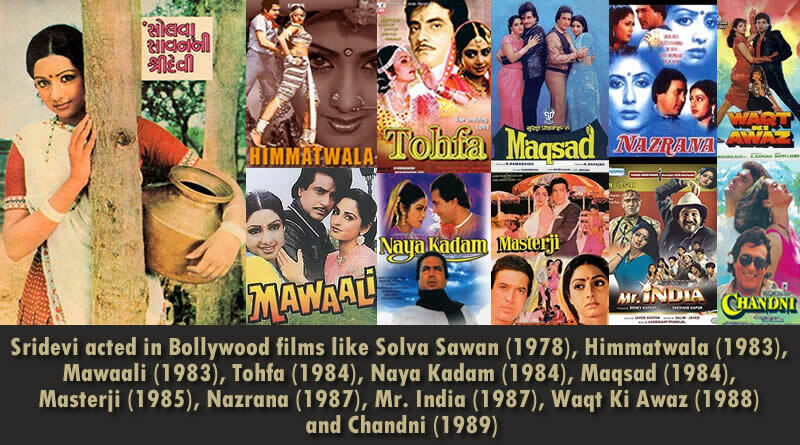 Bollywood’s icon and vivacious actress made her debut as a lead actress in Solva Sawan (1978) and tatsed success with the movie Himmatwala (1983). She appeared in a string of commercially successful flicks such as Mawaali (1983), Tohfa (1984), Naya Kadam (1984), Maqsad (1984), Masterji (1985), Nazrana (1987), Mr. India (1987), Waqt Ki Awaz (1988) and Chandni (1989). She also received critical acclaim for commercially successful flicks such as Sadma (1983), Nagina (1986), ChaalBaaz (1989), Lamhe (1991), Khuda Gawah (1992), Gumrah (1993), Laadla (1994) and Judaai (1997). Sridevi has won five Filmfare Awards and has been nominated ten times. Sridevi did comeback infilms after a 15-year-long hiatus with English Vinglish in 2012 after fulfilling her family responsibilities. Sridevi was last seen in the film MOM produced by husband Boney Kapoor. The Government of India awarded her the Padma Shri, the fourth highest civilian honor in 2013. She was also voted ‘India’s Greatest Actress in 100 Years’ in a CNN-IBN national poll conducted in 2013 on the occasion of the centenary of Indian cinema. Preity Zinta posted, “Heartbroken & shocked to hear that my all-time favourite #Sridevi is no more. May god give peace to her soul & strength to the family #RIP”. 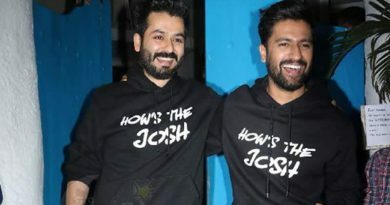 Riteish Deshmukh wrote, “Terrible terrible news…. Am shocked beyond words. SRIDEVI ji No More…RIP”. Jacqueline Fernandez tweeted, “An absolute icon. Gone too soon, #Sridevi. Too soon…”. Sridevi is survived by daughters Janhvi and Khushi Kapoor and husband Boney Kapoor. Our heartiest and tearful condolence for our legendary icon Sridevi. RIP to Sridevi. ← Big B’s protest against Twitter by a poem! Always accept average response to my films, reveals Anushka Sharma! Sara Ali Khan’s tantrums on the sets of Kedarnath?